So this week I had a hair epiphany thanks to a couple of my clients. I have educated them well in all the blonde tricks; turn down the irons and regular treatments, yet I’m still seeing hair breakage around the areas where they tie their hair up. So this is the point that I introduce you to the humble Scrunchie. The 80s icon may just be what your blonde hair needs. For those of you that don’t know what a Scrunchie is, let me explain. A Scrunchie is a piece of elastic incased in a piece of material. Colour matched to your outfit if you so choose. If you are seeing unnecessary breakage around the area that you regularly tie your hair up then let me tell you what a Scrunchie can do for you. Less damage than a regular elastic- especially a rubber band. Anything grippy on your hair will pull and trap the hair, causing breakage. 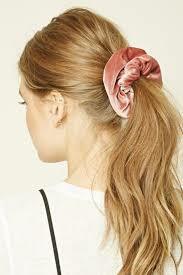 A Scrunchie is softer on the hair and the material stops the pull of a bare elastic. You can custom match to your outfit- if you so desire. Yes it was a look in the 80s but I’m sure it can be rocked in this day. Never tie your hair up wet, even with a Scrunchie, as hair is in it’s most vulnerable state when wet. Never sleep with your hair in a ponytail. The movement throughout the night can cause breakage. 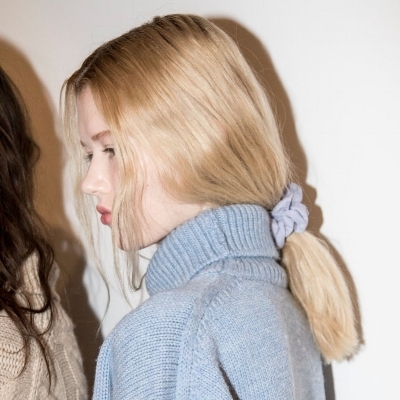 Change up the location of your ponytails to move the pressure of the one area. Think of all the new looks you can discover. Life’s too short for the same ponytail position. So in conclusion if you are doing all the right things and you still have breakage on your blonde hair then consider hunting down a Scrunchie or two.